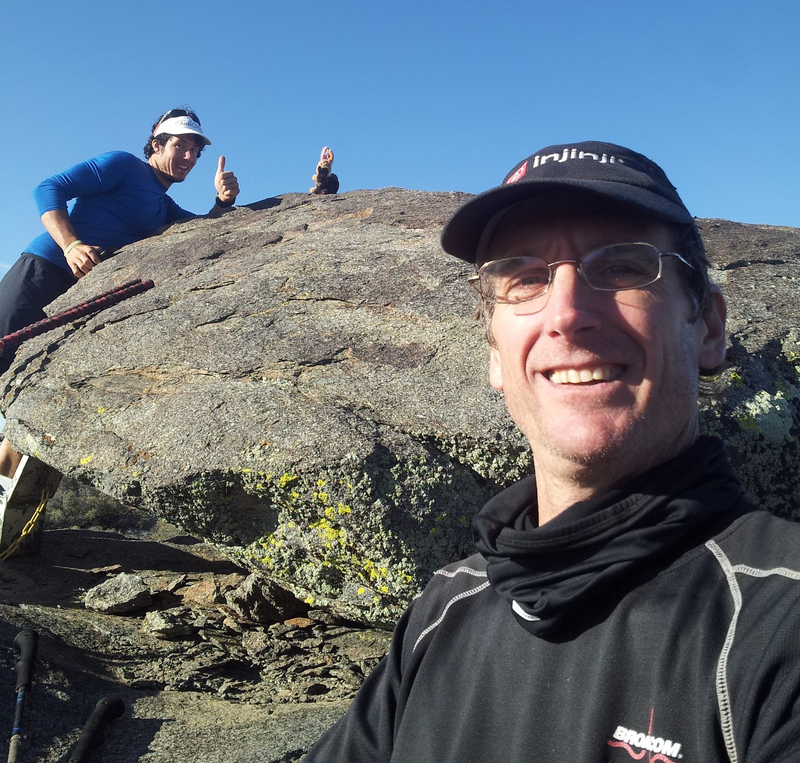 This is a trip report of a self-supported traverse of the Santa Rosa Mountain Range from hwy S-22 Northward to hwy 74 in one push by Robert Hunt and Nickademus Hollon (his account can be seen here). The Santa Rosas are a rugged peninsular range that have been uplifted among three major fault zones alongside the down-dropping Salton Trough to the east. It rises out the of desert floor near the town of Borrego Springs from about 1,000 ft to its high point of 8,716 ft at Toro Peak to the north. Lying within the counties of San Diego, Imperial, and Riverside, between the Borrego and Coachella valleys, it has historically been home to the Cahuilla Indians. The five major peaks—Villager, Rabbit, Dawns (aka Lorenzens, or 6582), Toro, and Santa Rosa—are composed of batholithic rock and make up a crest that quite often drops thousands of feet on either side. The violent tectonic formative forces and tough lower Sonoran Desert plant life combine to make this some of the most remote and extreme terrain in the southwest. I write this as a disclaimer! To underestimate the time and effort required to travel along its crest would mean an underestimation of the water required and there really is no easy way out once an attempt is started. It is not uncommon for a trip from hwy S-22 to Rabbit Peak & back to take a day and a half and require gallons of water. Rabbit Peak is not even a quarter of the way to hwy 74 and is by far the easiest portion to travel. We intended to traverse the entire range in a single, self-supported push. Due to the severe difficulty of this endeavor, I am hesitant to note the amount of water we carried. It was meticulously calculated to suffice, with many pre-planned reassessment points, and yet allow for fast travel. I have such a profound love of this area and have considered this adventure for so long that I feel a need to tell a more in-depth story of how this came to be, so it’s a rather long trip report. When I was a young teen, my mom joined the Sierra Club and became friends with a woman who was enamored with backpacking to obscure and remote desert landscapes. Her son and I quickly became best friends and soon learned how to navigate through difficult terrain well enough to stay clear of the parental units. It was during one such trip to lower Rockhouse Canyon that I first seriously considered climbing Toro Peak. It looked so crazy far away and yet so attainable. I had no clue of what it would take to reach its summit from there, but then, I had no clue about a lot of things at that time. Five years would pass before my friend Scott and I went for it, and that first time standing on Toro Summit was a magical moment for me. I looked down at the approach with pride of what I had done and anxiousness knowing what it would take to get back to the car. I looked down the Santa Rosa Crest at Rabbit Peak, and Font’s Point way off in the distance and thought how wild it would be to traverse the whole thing. How long would it take? How much water would have to be carried? Could it be done in one push with minimal water? The answer to this last question was obvious. It would be impossible! Years later, I would spend 72 hours soloing a loop from Hidden Spring at the end of Rockhouse Road, through Rockhouse Valley to Toro Peak, down the crest past Dawn’s, Rabbit, Villager, to S-22, across Clark Dry Lake, and up through the canyons back to my vehicle. As I was about to start down the crest with a heavily water-laden pack after summiting Toro, I contemplated what a long journey I had ahead. Especially given that even when I hit the desert floor I still had to make it all the way back across Clark Dry Lake and through the canyons to my truck. I again wondered, as I looked down that endless undulating ridgeline, if it could be done in a single push. I remember feeling that it seemed improbable. 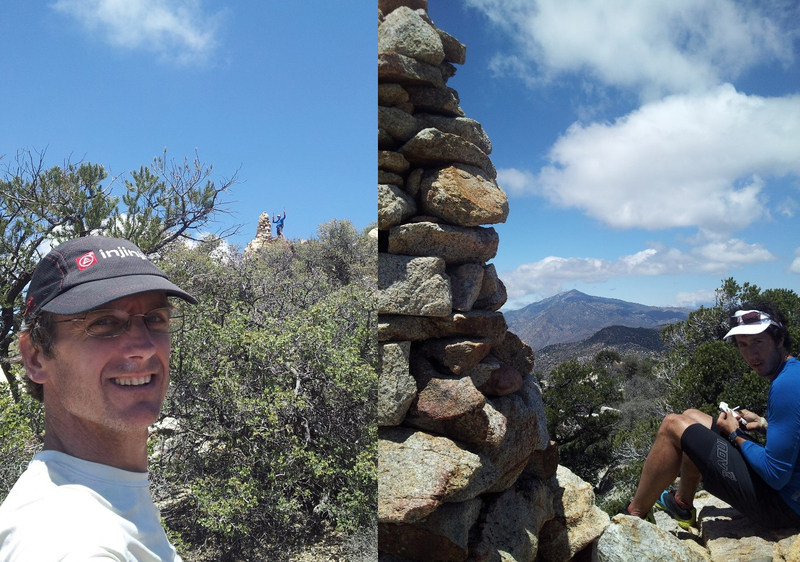 In 2013, my friend Greg Wagner and I parked near Hidden Spring, climbed Dawn’s Peak via Rockhouse Canyon, descended the crest over Rabbit and Villager to S-22, and returned to our vehicle via Clark Dry Lake. That was a long day made exponentially longer because I lost a water bottle in the brush and sorely missed it while crossing the lake bed. That morning, as we summited Dawn’s and viewed the entire Santa Rosa Mountains from the high midpoint, I again asked myself if the whole ridge could be done in one single push. This time I knew that it was inevitable. My trail experience has developed from a deeply rooted love of the outdoors and an athletic ability instilled by sheer impatience. Through my love of trails I am lucky enough to call some really talented runners my friends. When I learned that two such friends (Greg Wagner and Nickademus Hollon) had also considered a 1-day traverse, the planning ensued! Greg claimed that the ‘purist’ way to climb a mountain is from the bottom, and we agreed. The plan was to start from Hwy S-22 in Borrego and traverse the ridge in its entirety, finishing at the Pines to Palms Highway (Hwy 74). We would go completely self-supported, and have no pre-stashed water or food, so planning was key to say the least. We set the date for this last Feb 26th, in the hopes that it would still be cool enough to carry minimal water. Unfortunately the date came and went due to health issues for a couple of us. This was disheartening because the window for such an attempt is narrow, as it can get dangerously hot along the whole route. It came as a complete surprise to get a call from Nick on Thursday May 21st saying, “Hey Robert, my Death Valley plans for this weekend fell through. You wanna do the traverse?” My reaction was to chuckle and say, “Hell no! Are you nuts?” But, it only took a brief triage of my thoughts to realize that the great big hammer of serendipity had just hit me on the head. I was in shape, the weather window looked crazy good, it was a holiday weekend, and my wife was saying, “Go for it!” Oh how I love that woman! We immediately hashed out the logistics of a car shuttle and expected water/nutrition usage, and planned to meet the next night just north of San Diego. I’d like to try to clarify what it means to traverse this range in one push. These mountains have no reasonable escape routes. The ridge often drops thousands of feet on either side, over precipitous terrain and long alluvial fans that would only put you on rugged desert floor with miles of arroyos and washes before reaching any roads. There is no water, zero, nada! The brush is stronger than the extreme winds that often rip through and are certain to steal your time, and time is water. Because there is desert on either side of the ridge, any precipitation that lands on it evaporates pretty quickly. This means that you lose water pretty quickly, too. The water weight conundrum is very real. If you carry more, you move slower and therefore need more water. If you don’t carry enough… you could die. So while Nick attended a play with his significant sweetie, I watched my son’s mad baseball skills in action and we didn’t leave town until 10:30 Friday night. We caravanned to the Santa Rosa Mtn Rd turnoff on hwy 74, the Pines to Palms hwy, and left my car there as we headed towards Indio in Nicks’ Jeep. We had an eager driver pass us on that dark and winding road and in just a few minutes, we found out that they were too eager. They had clipped the rocky hillside and smashed the car up pretty bad. As we slowed down and rolled over all the freshly decomposed granite, I could see the driver on a phone and the passenger on a laptop and they seemed ok. We passed an emergency vehicle rushing to them mere minutes later. Technology to survive a major crash and bring quick he lp contrasted starkly with what we knew we were about to do. We park ed at the callbox on S-22 below Villager Peak at about 2:30 am and sat in silence as the Jeep rocked in the cold wind. We tried to sleep for a moment but I was too nervous, neither one of us wanted to get out and start this madness. 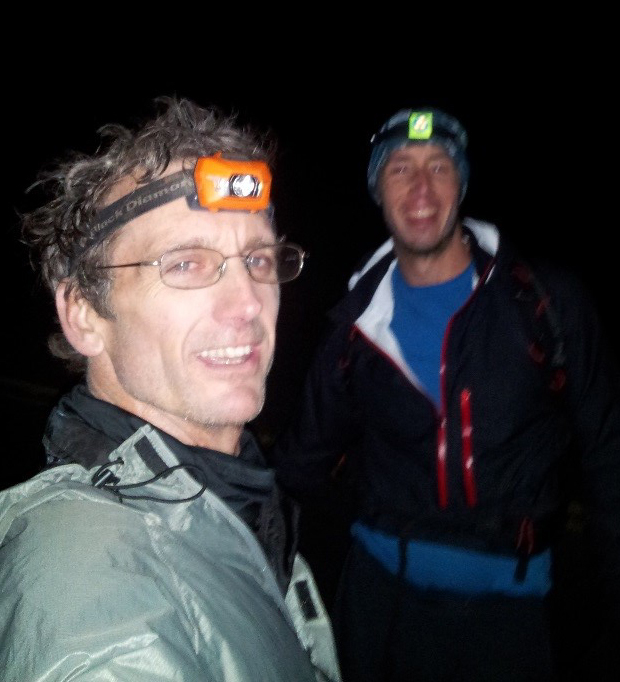 As we put on our tights, gaiters, and gloves…oh wait, Nick didn’t bring gaiters and he wore shorts! I suddenly felt meek and overdressed (ha, no! I still have some flesh on my legs). So when I finally said that I didn’t want to leave the Jeep, we knew it was time to leave the Jeep. After high-fiving in the middle of S-22, we were off at 2:53 am. Now, Nickademus Hollon is a force to be reckoned with, he holds the FKT to Rabbit from S-22 at a ridiculous 2:39:40 (this was only his half way point on an out & back) so I was quite concerned about too fast of a pace early on while our packs were the heaviest that they’d be all day. He paced us beautifully across 2 miles of soft sand, skirting Lute Ridge (thought to be the largest fault scarp in sediment on the North American continent), before leaving the valley floor and making the climb to catch the sunrise from Villager Peak at 5:43 am. The wind died down to just a breeze and the recent rain made for incredibly detailed and brilliantly colored horizons. At one point, I lifted my clear water bottle to my lips and was blinded by a brilliant red-orange glow magnified by the water. It began to warm as we hit Rabbit Peak at 7:22 am. We signed the register in the ammo box and had a quick break while still in familiar territory. As other trip reports note, stepping off Rabbit to the North is a note-worthy thing. If you think Rabbit is tough, well, you’d be right but it definitely gets tougher. We were careful to focus on Dawns Peak and not let our gaze land on the tiny Toro so very far away. We worked our way through scrub oak and cactus and along craggy spines between saddles to reach a disappointing false summit during the last thousand foot climb that left us 2.5 miles short of our target. Coyote Mtn and Clark dry lake sat below us to our left and I would periodically glance at them to gauge our progress but they refused to budge. When we at last spied the iconic Dawns rock cairn it was already noon and we were in need of a break. This peak is difficult to reach from any direction and is remote enough that the register had very few entries. 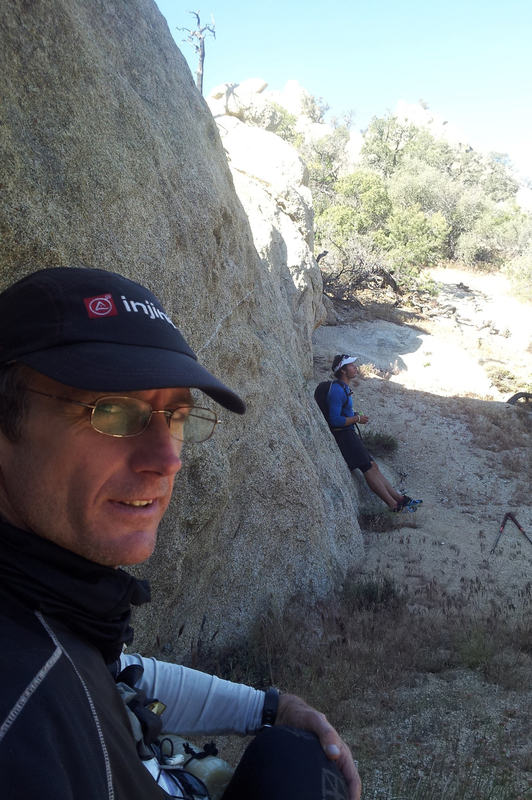 I sat under the shade of a wind-twisted Juniper to eat my lunch while Nick read and signed the logbook. I was thoroughly enjoying the rest, the view, and the progress when I got the sudden urge to dance to the tune of “Ants in my pants”. These guys really like to wait until they reach tender places before they lock on in a coordinated fashion. This suddenly full dance card actually shifted my focus from the anxiety inducing enormity of our route to the minuscule world at our very feet. I thought about what sustained the ants and what the ants themselves were fodder to. During this time, we assessed our progress and I felt that my remaining water and food were within expectations but I was careful to not look at the still tiny Toro for too long. Between the fatigue and the knowledge of what lay ahead, we took over forty minutes to get moving again. We could see that we had a 500 ft drop before climbing to a peak 2.5 miles distant and at that point, the final climb to the Alta Seca Bench and on to Toro didn’t look too far past it. When we topped out at about 6,500’, we could see the chaotic mix of ridges, canyons, saddles, and boulder piles at the bottom of a 1,000’ descent that had been hidden from us until then. This is when the full remaining 3k of climbing through dense brush and jagged hillside to Toro became obvious. Although I knew of this area, we still had to choke back a dose of dashed hope when we saw that we would soon lose the precious brush hindered vertical we had just put in the bank. The worst part of this section was that at every peaklet, we could clearly see the thick scrub oak, Juniper, and Manzanita that we would have to deal with as we descended and then climbed to the next peaklet. I mean, every couple of hundred feet we’d be presented with a whole new set of challenges. The upside was that every descent to a saddle meant a view down a canyon to the desert floor and every climb to an outcropping presented views that were downright distracting. Nickademus and I make a good team in rugged terrain. We both follow our instincts and constantly communicate as to whether we’ve had success or not so that the other may alter course as he sees fit. This process works well when we are accurately judging the difficulty of each new impediment but starts to fall apart as soon as we stop caring about scratches, gouges, pokes, and bush-slaps. “Hey Nick, it’s not look’n too good here, maybe. You got a way through over there?” “No, I’m walled out here.” This would prompt me to reconsider the options I was facing and Nick would veer towards me. His answers evolved from an examined “No” to a paused “Maybe” and finally to a consistent “Yeah” followed by the sound of breaking branches. It got to the point that I’d climb a boulder and plot a route forward that I thought looked pretty good only to find that he’d already plowed ahead far enough that I had to chase him because his route was now guaranteed to be humanly passable. We struggled through the final 2k’ climb through exceptionally dense brush to the Alta Seca Bench and wasted a lot of time when we made a bad routing decision that both of us were too tired to address until we were forced to cross a dense terrace and hillside in order to get back on track. Once we reached the Bench, I was on familiar ground and knew we were going to make it through the whole thing. Huge Ponderosa Pines and their fallen comrades, unmolested by firewood seeking humans, towered over us as we gleefully (maybe it was just me) made our way up through meadows carpeted in pine needles and ringed by the bright red trunks and green foliage of manzanita that we didn’t have to bust through. It was getting late and we really picked up the pace in order to make it to Toro before the sun set. At 7:41 pm, we stood atop Toro Peak in time to enjoy a stunning view psychologically enhanced by the extreme effort we’d gone through to see it. The air up there was so dry that the cloudy, moisture-laden air rolling in from the coast was very clearly delineated into a thick blanket that followed the contour over Hot Springs Mtn, down to Coyote Cyn, over Buck Ridge, across Rockhouse Valley, and into the western base of the Santa Rosas. San Jacinto stuck out of the clouds in full, majestic profile. The huge pyramid of a shadow from Toro stretched out behind us over the Salton Sea. We donned an extra layer and pulled out our flashlights while eating whatever we could find in our packs. This was a wonderful moment and our high spirits carried us forward even though we still had one more peak and 18 miles to go. The remainder of our trip was on a maintained dirt road so we were able to settle into a 10 or 11 minute/mile pace and make the side trip to Santa Rosa Mtn by 8:57 pm. A couple were sitting by a campfire with a child in a tent nearby when we topped out and seemed more than a little wary of these two dirty, sweaty, and tired guys appearing out of the darkness. When I asked, it was very reassuring to hear them tell us the exact milage to the highway as we now had a concrete finish line to stumble towards. I’m not a fast road runner and I knew that I would have a hard time keeping up with Nickademus but the day had gone so well for me as far as pacing my water, nutrition, and effort, that we both made good time through those last long miles. At about 6k’, we dropped into the cloud blanket and visibility plummeted to a mere couple of feet. I took my flashlight off my head and held it in my hand down low to minimize glare and really tried to focus on whichever side of the road I was on. The problem was that I’d watch the left side, blink, and see the right side. I was falling asleep while running. This happened over a dozen times. The reflection from the back of a parked car emerged from the mist and as we started to congratulate each other, we could see that it was not my car, but it tempted us with the notion that we might be close. This was hard to ascertain because we were both too tired to do any milage calcs at that point. When my car finally came up to meet us, we ran on past it the half mile or so for a weary but happy hug in the middle of highway 74. We had done what we set out to do but we still had to get back to Borrego. We were actually able to run back up to the car and I took first shift driving. It’s a 1.5 hour drive with only a couple of turns but we knew it’d be tough. I stopped and bought a big can of Monster energy drink and can vividly recall downing the cold, wet, sugary, fizzy treat and waiting for a little boost. Waiting was futile, there was nothing, not a damn thing! Not even briefly. I might as well have drank a soda water. To this day, I have really tried and for the life of me, I can’t remember actually stopping and buying that drink. We were so tired that we got lost twice and it ended up taking us three hours to reach Nick’s Jeep at about 2 am Sunday morning. We said our goodbyes and I drove to Rockhouse Road and promptly fell asleep for a few hours before driving home at sunrise. My favorite memories are of the innumerable clear areas on saddles along a ridge in the sky, many of which had signs of ancient human presence. We even came across a one person rockhouse with a grinding slick out front that may have served as a hunter’s shelter or a waystation of sorts. Two things I didn’t enjoy was the fact that I had broken my prescription sunglasses prior to this trip and a case of lingering Plantar Fasciitis. I really could have used sunglasses up there. [Edit 7/2/15 20:06:32 included the time it took to get back up to the car. I owe a great deal to my late step-father Arnie, who showed me that even a grand adventure can be broken down into manageable pieces and that it is up to me to make sure that it stays grand. I was also inspired early on by my mom’s adventurous spirit, and by the late Jerry Schad, his love of the Santa Rosas, and his willingness to endure what it takes to enjoy its rugged solitude. Many thanks to my good friend Nickademus Hollon for bringing his energy and skillset to bear when it was needed most. This traverse was no joke but I can’t wait to get back up there again! Rob, this was amazing; you are amazing! And the writing is perfect! Aaah shucks, love you mom. Wow, what an amazing trip and account. You guys are beasts! There aren’t many people who can accomplish what you have done in such a harsh environment. Congratulations. Well done! Very inspiring. Thanks for sharing. Nice report. I’m planning to do this the “easy” way and at a vastly slower pace from Toro down, and I’m glad I know what I’m up against.